Classic cotton balls are soft and gentle to all skin types. They are perfect for the removal of make-up and nail polish. Use to apply oils, powders and lotions to baby's delicate skin. Soft, safe care for cleaning baby's eyes, ears and nose. 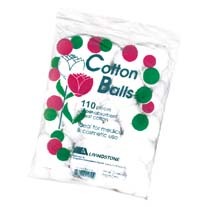 Cotton rounds are useful for everyday clean up, polishing, and for use with hobbies and crafts.